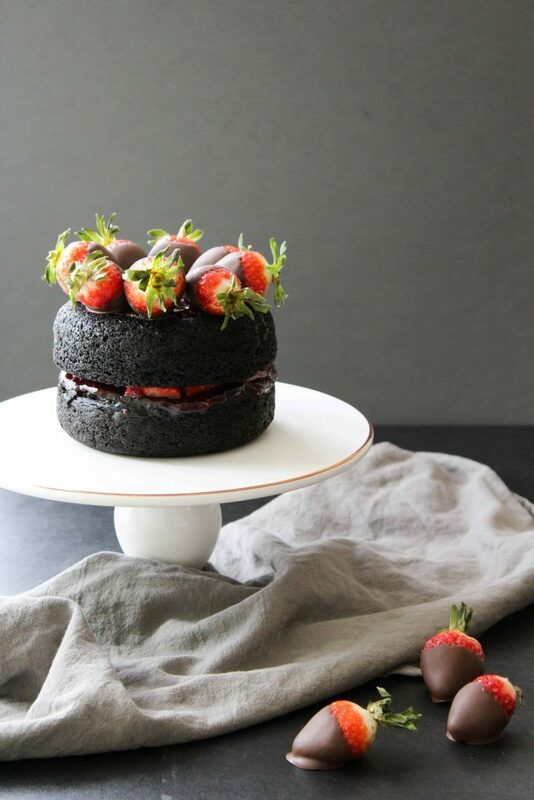 If a chocolate cake and a brownie had a baby, it’d be this fudgy Dark Chocolate Strawberry Cake! It’s a hybrid between light and fluffy, and dense and fudgy, with fresh strawberries and strawberry jam on top. Have you ever seen the Friends episode where basically Joey’s whole storyline is that he doesn’t share his food? Yeah, I can relate. As much as I’d like to have every single bite to myself, sharing is caring after all. And, really, what better day to be sharing than Valentine’s Day! 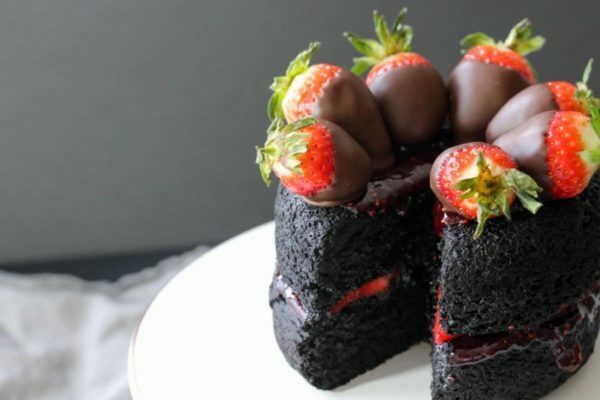 Typically, if you’re getting a Valentine’s Day dessert, you’re either going to have to go the route of purchasing an entire cake or just a slice of one. And, as I said before, sharing one personal slice of cake is a no-no, if you ask me! 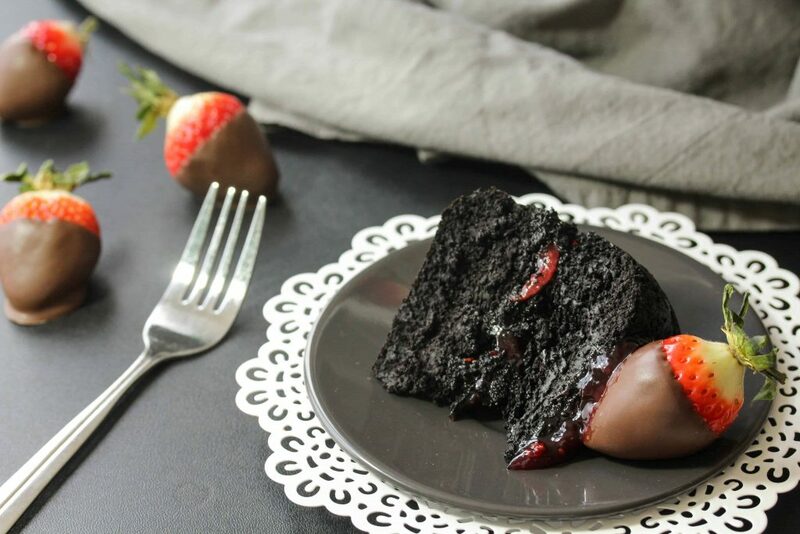 Which is why this 6” fudgy dark chocolate strawberry cake is the perfect dessert for you and your sweetheart! Not only is it big enough to share, but it’s not toooooooo big that the two of you will be eating it for breakfast, lunch, and dinner the next day. I think two layers is perfect for this cake, because you get those delicious, juicy, fresh, strawberries and wonderful jam filling in the middle as well as on the top. 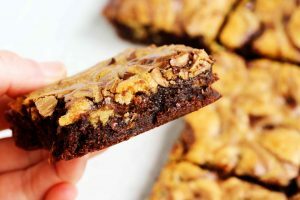 But, the nice thing about this recipe is that the recipe makes 1 – 6” round, so you can make the recipe as many times as you want to create your desired amount of layers. 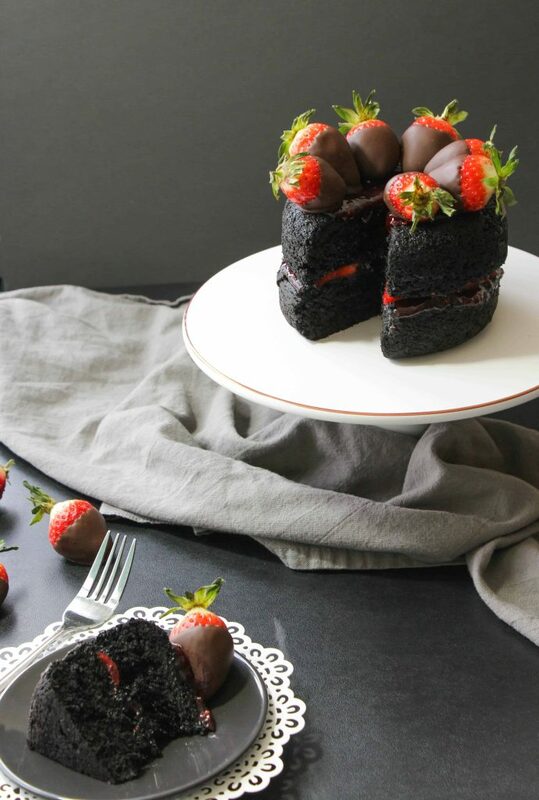 More layer = more chocolate = more strawberries = more goodness (= more to share and more for you )! Unlike traditional cakes or brownies, this layered cake is full of nutrients! The pumpkin adds to its’ fudginess and is full of fiber, potassium, and vit C, which is all good for your heart. There is less refined sugar in this cake, because it’s replaced with dates. I love dates! And I don’t mean the Valentine’s Day kind . Dates, besides being naturally sweet and scrumptious, are chock full of antioxidants, which can protect against chronic diseases, like cancer. 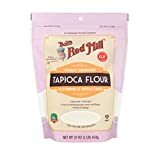 And, while the recipe calls for an egg (which is a great source of protein and lends to a smoother, creamier, texture), you could easily replace it with a flax egg, which gives you a great plant-based source of Omega-3’s. 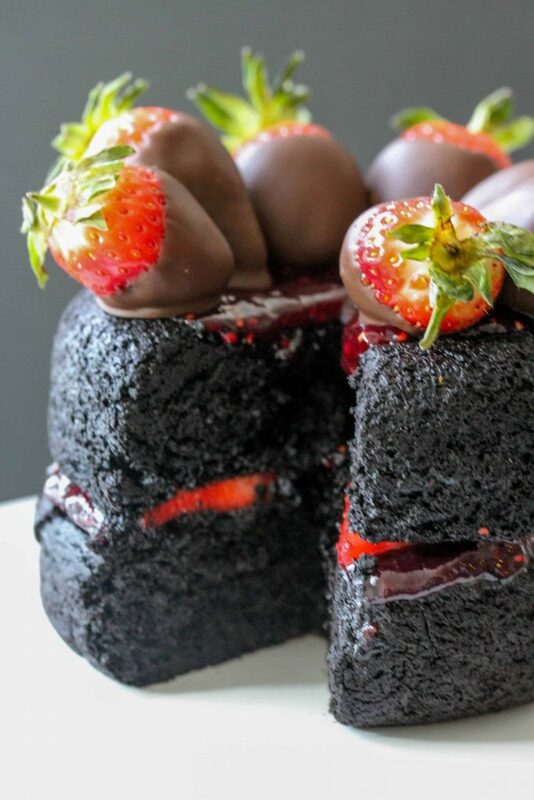 If you make this delectable dark chocolate strawberry cake for you and your sweetie, be sure to snap a pic and share it with me @HealthyHacksRD! For the chia jam: puree the strawberries in a food processor or blender. Stir in the chia seeds. For the cake: preheat oven to 350 F. Grease a 6” round pan. In a food processor or blender, blend the dates, water, and oil together until the dates are almost completely blended. Add in the pumpkin, egg (or thickened flax egg mixture), sweetener, apple cider vinegar, and vanilla extract. Blend until completely smooth. 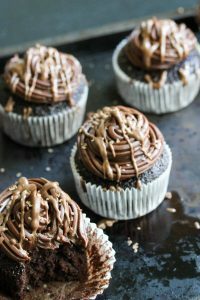 In a medium bowl, whisk together the cocoa powder, tapioca flour, baking powder, baking soda, salt, and instant coffee. Add the wet ingredients to the dry mixture and stir until well incorporated. Be sure to scrape the bottom of the bowl well to get any hidden dry ingredients. Pour the batter into the prepared cake pan. The dough will be pretty thick. Smooth the top of the batter to reduce any bumps baked into the top. Bake for 30 – 35 min. or until the edges are firm to the touch and the middle is slightly squishy. A toothpick inserted into the center of the cake will come out with some wet dough on it. Repeat these steps as many times as you’d like to get your desired amount of layers. 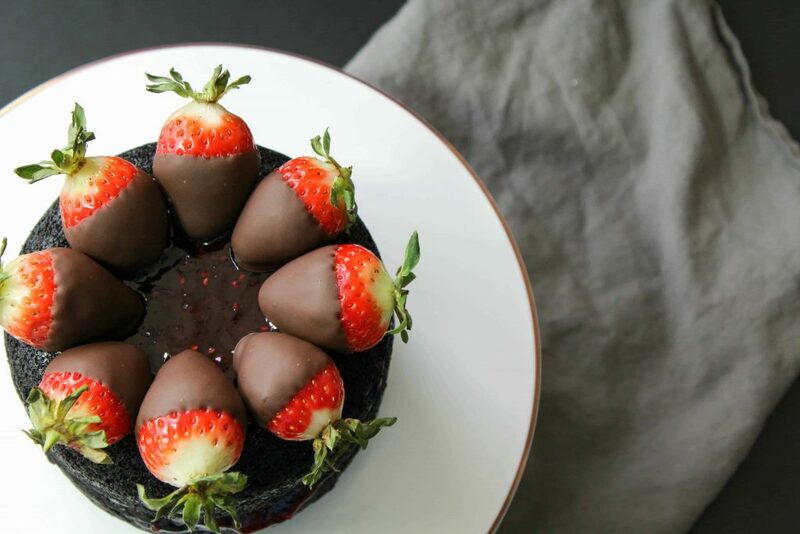 Feel free to garnish the cake any way you’d like, but if you want to make the chocolate covered strawberries: place a sheet of wax paper on a cookie sheet tray. Melt the chocolate chips in the microwave, starting with 1 min., and then continuing with 15 second intervals, stirring between each interval, until melted and smooth. 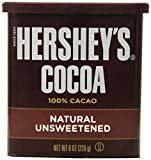 Pour the chocolate in a small, deep bowl. You want to be able to dip the washed and dried strawberries straight in and out of the chocolate. Allow any excess chocolate to drip off the strawberry and back into the bowl. Then, place the strawberry on the wax paper. 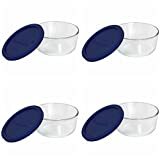 Once you’ve coated all your strawberries (you’ll need about 8 to decorate the outer rim of the cake like in the picture), place the tray in the fridge for a few minutes to harden. If making a multi-layer cake, thinly slice as many additional strawberries as you’d like to place in between the layers of your cake. To assemble a 2-layered cake: spread half of the chia jam on the top of one cake layer. Add the thinly sliced strawberries on top of the jam. Spread the remaining chia jam on top. Then, add your chocolate covered strawberries around the edges. 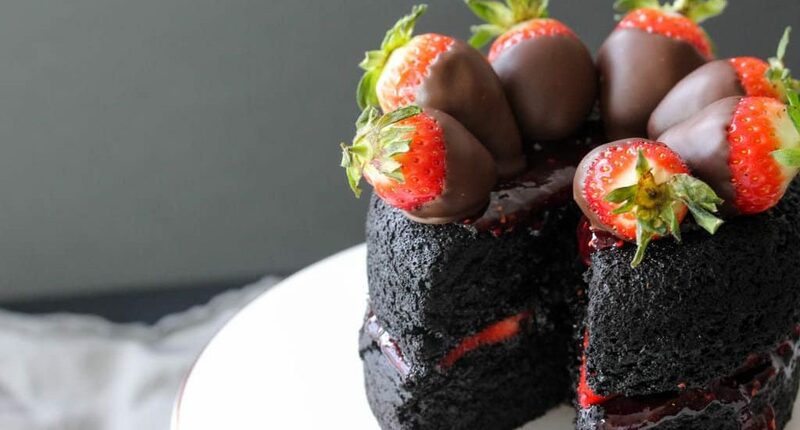 Slice up your delectable dark chocolate strawberry cake and share away! The recipe makes 1 - 6" cake with jam on top. For more layers, repeat the cake recipe, as is. I haven't tried doubling or tripling it all at once, so I can't say if it comes out the same or not. However, the jam recipe can be doubled or tripled without a problem.